Class Registration: To guarantee your space in a class, you need to register as soon as possible. To register for a class we require 100% of the cost of the class at the time of registration. No class spaces are held without full payment. Supply Discount: Students enrolled in a LYS class receive a 10% discount off their materials for the class. In addition, they can enjoy a 10% discount on products sold at LYS from the time of class start to the end of the course. An exception to this is for students enrolled in a year long class. You can use their 10% discount on the day class is held (not the entire year). Class Cancellation Policy: Class may be cancelled for fewer than 3 students. If LYS cancels the class, payment for class will be refunded in full or can be transferred to another class. Decision by LYS to cancel class for low enrollment will be made 24 hrs in advance and students notified by phone. Class may also be cancelled for inclement weather or instructor illness. Students will be notified by phone if this happens and can attend the rescheduled class or have their class fee returned 100%. Enrolled students who give 72 hours notice can get a full refund for their class. If less than 72 hours student will get a 50% refund. Students who fail to show up for class do not get any refund. Return Policy: Items purchased at the store can be returned 30 days from purchase with a receipt in original packaging and/or original condition. They must be intact and show no evidence of use or wear, and must be shelf ready without any smell of perfume or smoke. If you do not have a receipt you will receive store credit only. We reserve the right to refuse any merchandise deemed unsalable. Non-refundable Items: We regret we cannot give refunds for patterns, roving, wound yarn, special orders or sale merchandise. 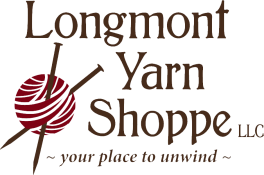 The Longmont Yarn Shoppe Loyalty Card is our rewards program. Participants get credit for the subtotal (before tax) amount of any merchandise purchased at LYS. After 7 LYS merchandise purchases you will get credit back that you can use on your next purchase! In addition, Loyalty Club members received our newsletter every week, chock full of inspiration and information about upcoming events and classes, free patterns, new products and sales. The best part, we think, is that you get a Birthday Card during the month of your special day with a gift for you from us! Our LYS Loyalty card is sold for $1.00. That dollar is given back to a variety of non-profits in our community. In 2017 we gave back over $1,200.00 to local non- profits with the sales of our LYS Loyalty Card. Phone Orders: Orders for products can be taken by telephone with a credit card. Items will be mailed First Class. Postage will be added to the purchase based upon weight and destination. Custom orders: Customers can order a yarn or product from a vendor we have a relationship with. If it is a type of yarn we do not typically carry, the customer will need to order and pay for full bags in advance. Custom orders are non-returnable and non-refundable.